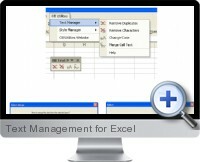 Text Management for Excel is a Microsoft Excel add-in that gives you the power to manipulate large amounts of text fast. Easily find and remove duplicates, merge the contents of selected cells, remove special characters and change case in various ways. These powerful functions can save you many hours of manual work with imported text in your worksheets. The interface is very easy and intuitive with smart wizard guidance. Find duplicate rows and then select, change color or delete them. Delete special characters from imported text. Merge cell text with custom character separator.